Two Final DTGD Challenge Projects! Hello! Well I can officially call myself a challenge Queen because I completed all the Dare To Get Dirty Challenges on SCS!!! I am running short on time this week, so I had to make my final two projects pretty simple. This first one was for the Pretty Packaging Challenge. I used this super cute template from Perfect Presentation called Cute Carton. This is the smaller 1 sheet version and it's just so adorable!!! 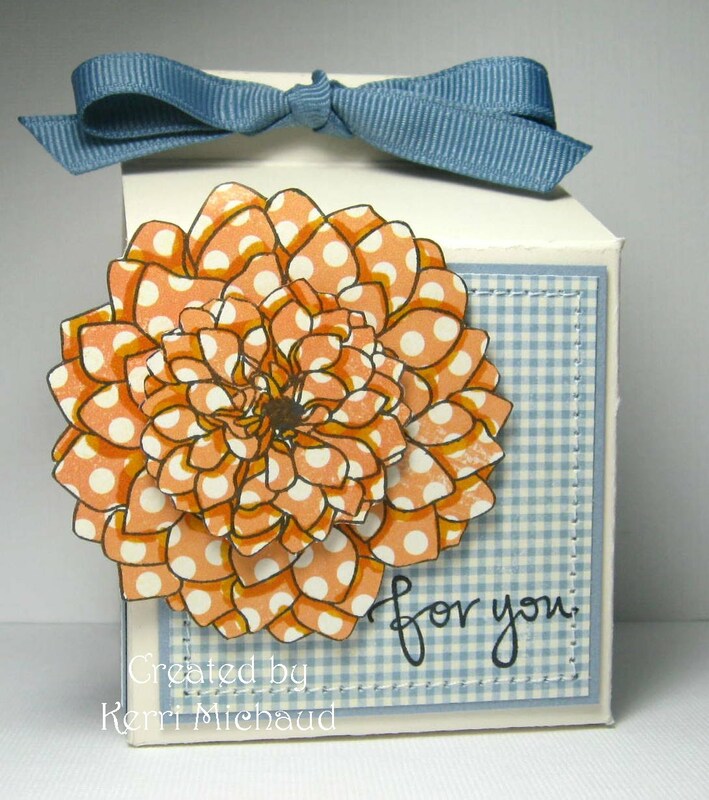 I paper pieced this gorgeous bloom from the PTI set Delightful Dahlia with some Making Memories Chloe's Closet dp. This was for the Just Faux You Challenge to use no patterned paper, ribbon, or other embellishments unless you made them, and for the CAS color on color challenge. I used my new PTI School Time set which I am going to have sooooo much fun with! I stamped the alphabet background with Real Red onto Pure poppy for the color on color part of the challenge. The bottom is embossed with the PTI Picnic Plaid Impression Plate, and I used my new Large Scallop Border Die as well. Very CAS:) Well, I have a ton to do, so I'm off. Thank you so much for stopping by and have a wonderful rest of your day! These projects are sooooo awesome!! You are a challenge queen--good for you! I love both but that carton is awesome with that big honkin' flower! Fabulous work! You go girl!!! Love the box and the card is darling! I just got my PTI release goodies yesterday and this school set was in it!! Can't wait to get inky!! Oh my word these are wonderful I LOVE that big flower on your first creation girl...totally GORGEOUS! Ohhh wowww Kerri,so beautiful box and card,i love the papers and the colours. That's a very cute and pretty box!! 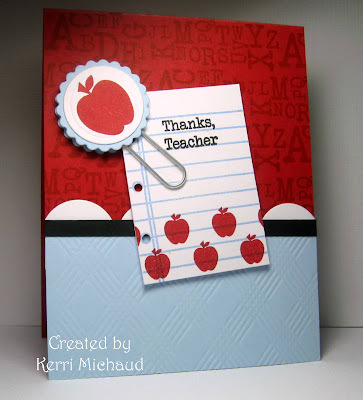 Your card is so cute and perfect for a teacher, it's great that you used no patterned paper too!! SO cute! Love your teacher card! That is so pretty!! Great job with both challenges! Very cute cartoon box! 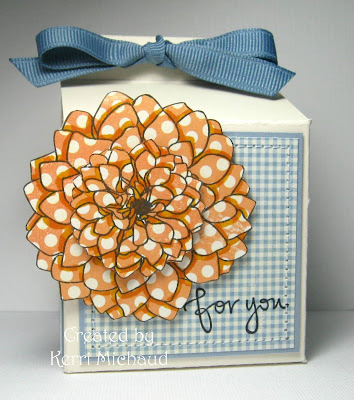 Love the paper pieced flower! And Thanks Teacher card looks fantastic! Love the paper clip embellishmnet you created! You are so wonderful at challenges, Kerri! This is really adorable. I love the little notebook paper.